My name is Antoine LAURENT, I'm 32 years old. In 2002, I participated in a delegation of 50 peace activists wanting to visit Israel and the occupied territories to meet the actors of peace in the region. I was 20 years old and it was the beginning of the construction of the separation wall, and my first trip to Palestine. Back in France, I decided to undertake studies of broadcast journalism ... After my studies, I participated as an assistant director on several short and feature films. I learned especially alongside Raphael Frydman, Bernardo Bertolucci and Catherine Breillat ... In 2012, I co-directed "Ez Kurdim" (I am Kurdish). A movie about the place of the Kurdish population in France and Turkey. February 2013, I went in the Palestinian refugee camps of Sabra and Shatila located in West Beirut. No movie was shot there but I am fortunate to be hosted by trusted friends. In the camps, the living conditions are disastrous, but I meet a bunch of great friends: Tarek Sobhi and Jalal were born here, they are my age and when everything pushes them to take up arms, themselves, choose to open academic support center, to focus on hope, believing in education ... I start filming and makes me realize that this center, this hope is a lifetime for them. 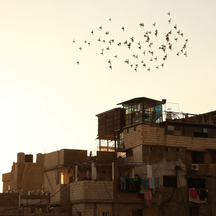 In June 2015, I decided to live and film in Shatila during five weeks. During this last shooting, the arrival of Syrian refugees in camps carries the film's story further than I had imagined ... On my return to Paris, information turns the refugee issue by numbers, me, I just left friends ... I feel the importance for this movie to exist. Just have to edit the film and broadcast it ... It's when you come !!! :-) Thanks to you, I hope to present this story to the public and show the film to cinemas. To discover the reality of the Sabra and Shatila refugee camps in Lebanon and thanks to you, help support their (s) "Refugee Dream(s)".